Hi Savvy Southern Style readers! My name is Shannon and I write and share at Fox Hollow Cottage. I was so excited when Kim asked me to share my Favorite Room with you. I knew I wanted to share our kitchen. It's one of my favorite rooms in our home. This room means the most to me because my dad, my husband and myself, did almost all the work ourselves. After that initial excitement wore off though, I quickly realized I would need to spruce it up a bit if it was going to be visiting here with Kim and her readers. It needed a wee fluff. I had sort of ignored it after the holidays and it needed some Spring decor for sure. Simple fix, grab some stuff from my decor stash and brighten it up. I do it all the time. Yeah… No. The decor mojo was not flowing. You know why? Because I wanted it to. How typical right? Our kitchen is definitely more on the casual side. Very classic with the white tile. Which was handy, since my dad knew how to install that (and it's le' cheap). Made choosing very easy! I selected a listello tile for the back splash and we added the beadboard as a nod to the cottage style of our home. 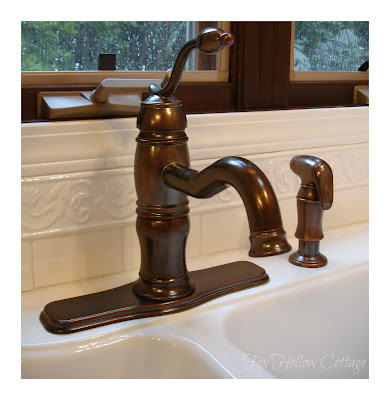 One weekend, m y hubby and I spent an afternoon searching the internet for the best price on this Belle Foret faucet. I forget who won but we got the original price down by several hundred dollars by the time we were done! When you enter our kitchen and look to the right, this is the view. The ceiling is vaulted. And it's vaulted extra high on the other side of that divider, so I've got lots of room to decorate above the cabinets, which is usually fun, unless you are trying. lol. Hard to get a picture at that angle though. Believe me... I tried. We've got a skylight up there too so we get some good sun in here and it stays bright even on rainy, grey, cloudy days. Works out great since we live in Oregon. Yes, it really does rain that much! Here is a peek into our sun room and a little glimpse of our repurposed fence board bar counter. The golden yellow honey bee hive container holds powdered sugar. 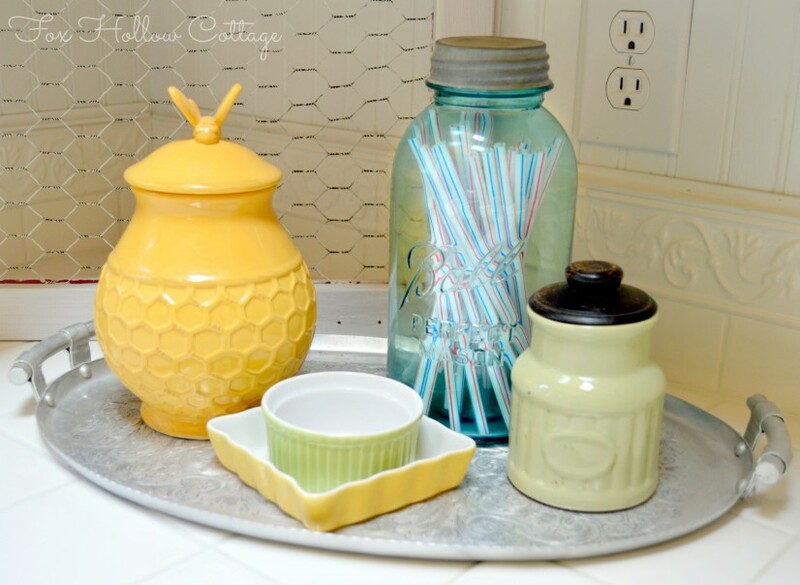 My vintage Ball mason jar is on straw duty and the small green container... is empty. I'll have to put that to work!! 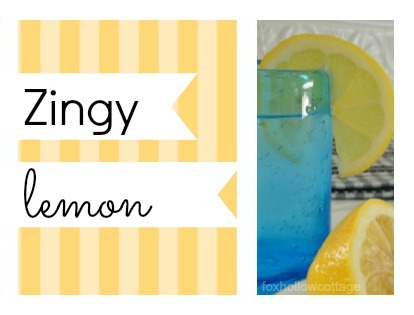 I love having fresh lemons on hand for drinks and to cook with. Bonus=they are bight and happy to look at too. Oh. There is that sun I was talking about! My white Roo is a kitchen staple, he matches no matter what. This is our casual dining area and my curtained pantry shelves. 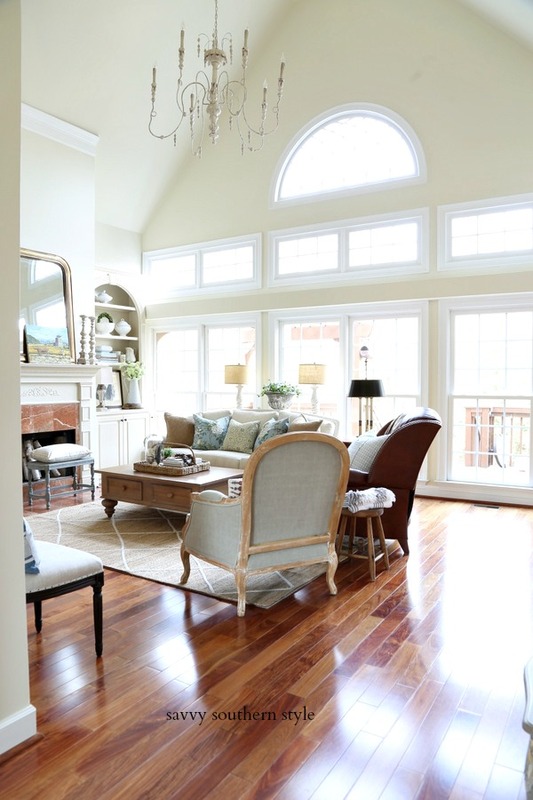 To the left is our combination living/dining room, and to the right (not pictured) is a step down into our sun room. Our first floor is very open. Especially for such an old home. I just recently tested out a new look to see if I liked it. 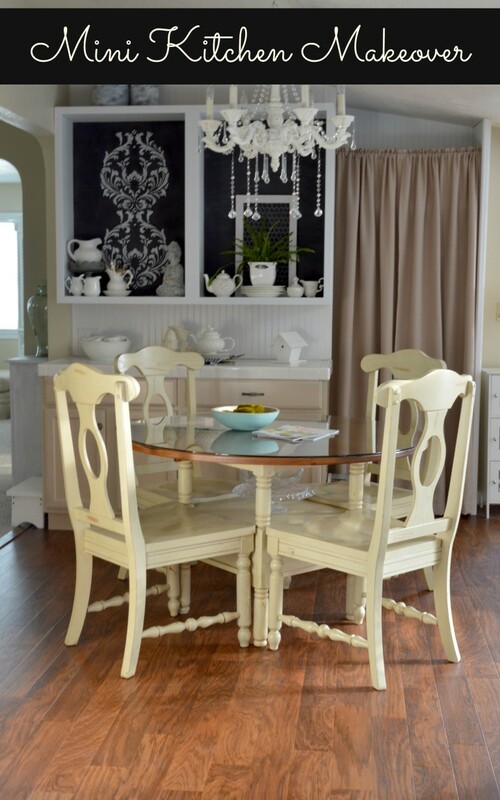 I painted my cabinets with Maison Blanche paint and then stenciled a design with chalk. I think I like it. I'm pretty sure my kitchen is going to be going white. I see some more painting in my future. Just for fun, I added two shots of what the kitchen looked like when we bought the house. Things are definitely looking up! Thanks again for having me Kim. I sure enjoyed my visit over here at Savvy Southern Style. 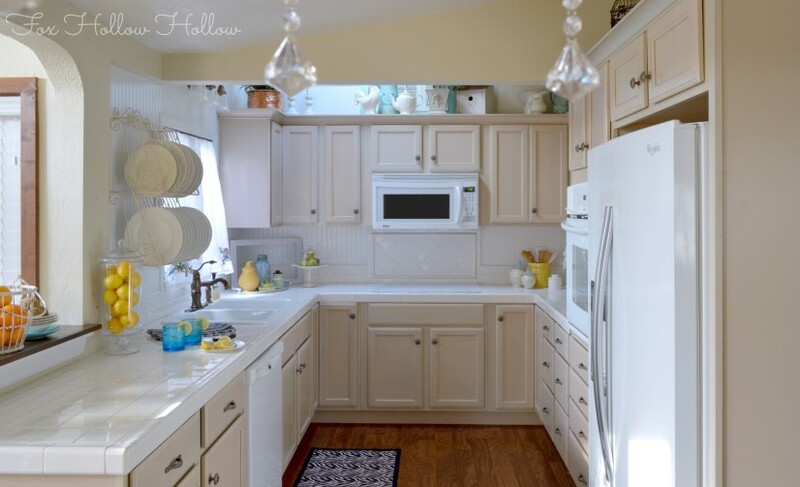 Thanks so much, Shannon for sharing your charming kitchen. 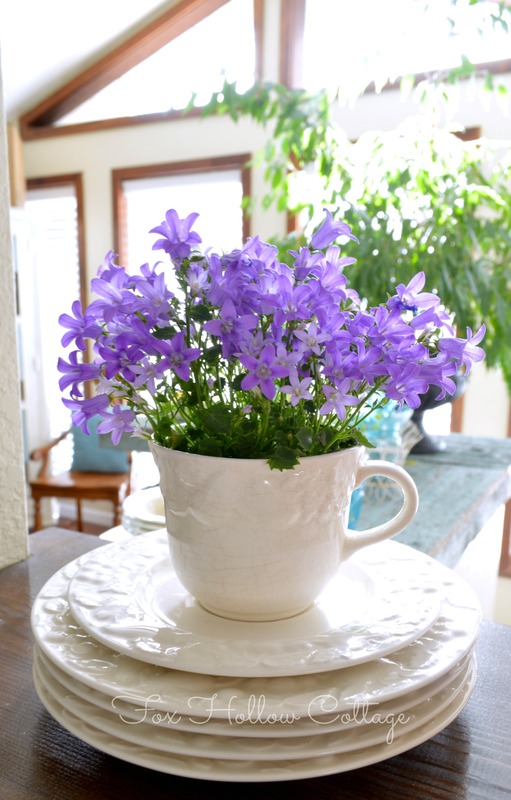 Okay, my readers, hop on over to Fox Hollow Cottage and be inspired. Lots of great projects and ideas shared there. Miss any past favorite rooms? See them all here. What a beautiful kitchen! I love how light and bright it is. It's just amazing to see the before pictures and now. Such a transformation! The stencil looks really pretty. Love Shannon's kitchen! 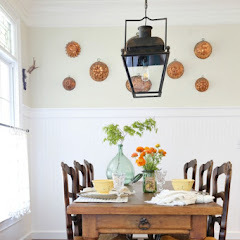 Such a pretty cottage look and I love that she and her husband did a good portion of the work. Gotta love Dad's who chip in, too! Thanks for sharing, Kim. Shannon, what a darling kitchen! I would never want to leave. You really infused it with such charm and warmth and beauty. I LOVE you thoughtful details and all the love you put into the heart of your home! Kim, another BIG winner this week!!!! 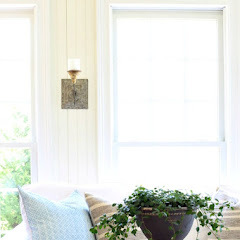 I need to spend more time just pouring over all the great details and sweet things Shannon and her hubbie did to make this such a beautiful space! LOVE this series!!!!!! 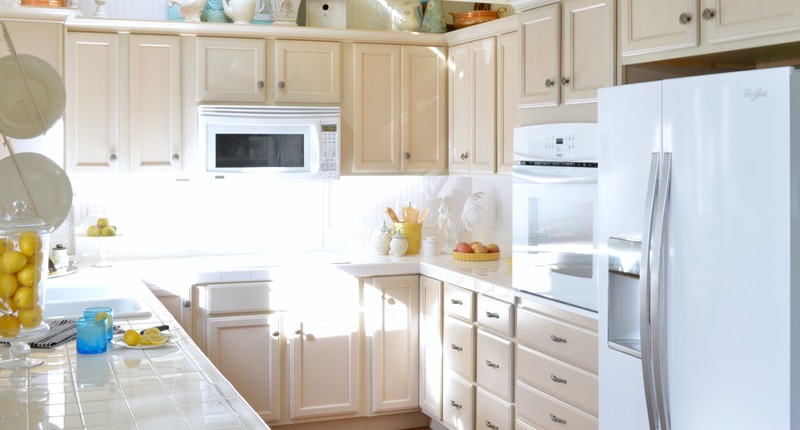 I love Shannon's kitchen and yes, I did shudder when I scrolled to the before picture...actually gasped! She has done such a fabulous job. Love Shannon and her style. She is the sweetest and love her blog. That before picture? YIKES! It looks very pretty now! Very bright. You all did a wonderful job. 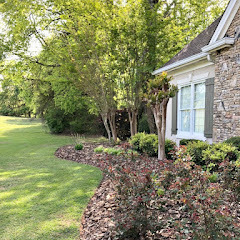 My favorite redo/reno's are always the ones my husband and I do together. 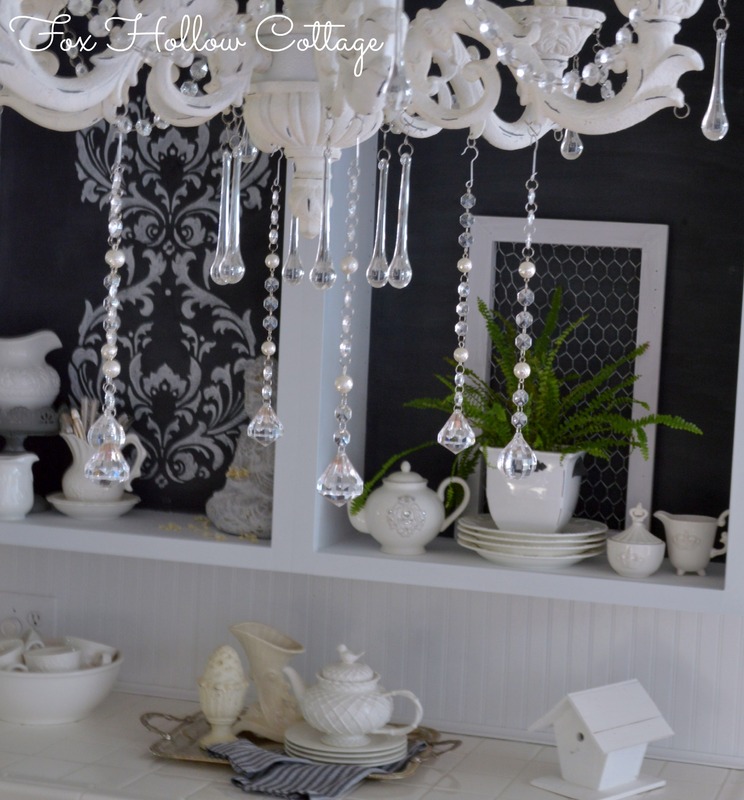 I have always been inspired by Shannon's kitchen redo! I was just amazed when I first saw it, and I'm even more impressed that they did most of the work themselves. 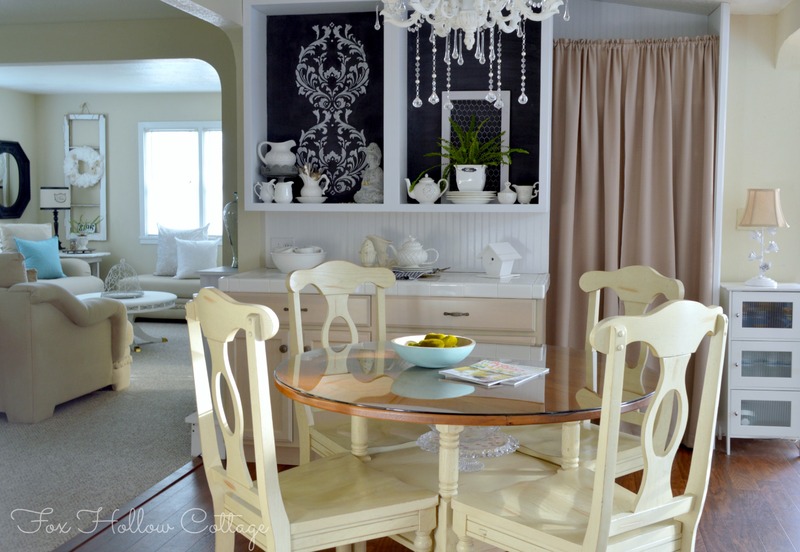 And the new stenciled design on the chalk paint is incredibly gorgeous! Shannon, I just love your beautiful home!...it is so bright and cheery with an incredible cozy feel...you have done a magnificent job in transforming and decorating your home..so many creative ideas!...Thanks Kim for presenting Shannon's favorite room today!!! Luv your beautiful kitchen Shannon! 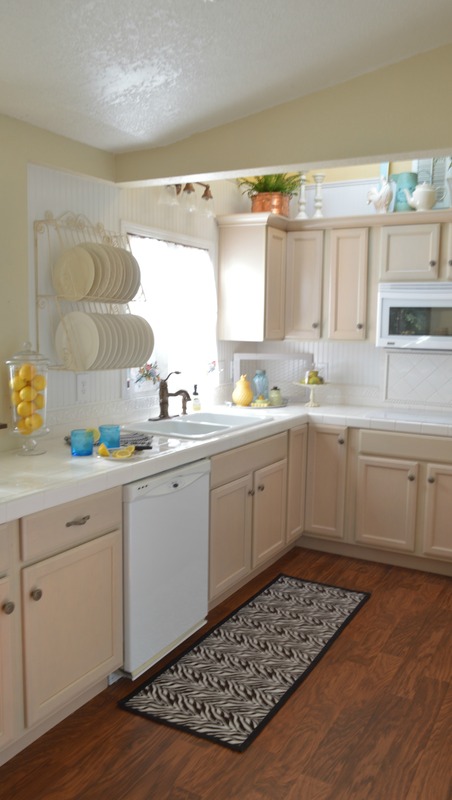 Thanks for hosting Shannon-she has such a pretty kitchen makeover. Shannon, You've done an amazing job on your kitchen! I love how bright it is. Your special touches makes it that much more charming! Love the kitchen. So bright and fun too. I just love her kitchen! Thanks for featuring her. Wow! What a transformation! I love the clean, fresh look. That faucet is beautiful too. 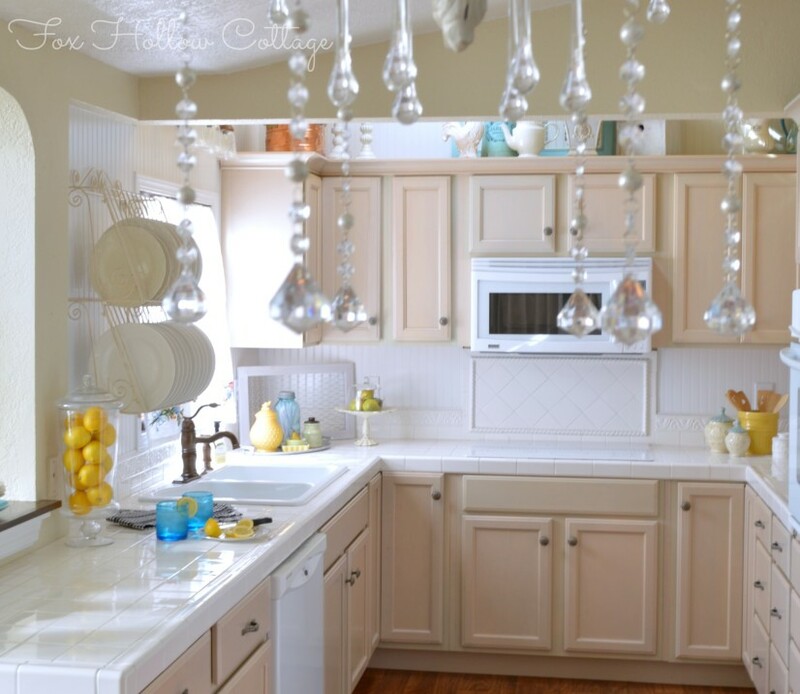 :) Very pretty kitchen! Wow what a difference. That kitchen is beautiful. thanks for sharing. Shannon, your kitchen is gorgeous. So light, bright, and fresh. I can almost smell those lemons! 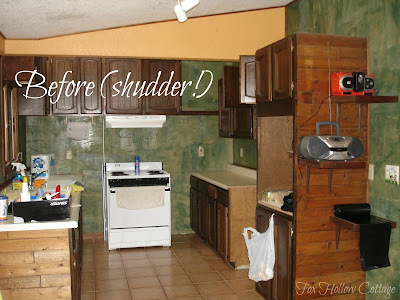 I enjoyed reading about Shannon and her kitchen transformation....and what a transformation ...WOW!What a lovely home! Shannon's kitchen is so bright and very pretty! I especially like the display on the cupboards near the round table. Love the white pieces with the beadboard against the chalkboard. What a great makeover! Thanks for sharing, Kim. Have a great weekend. Thanks again for having me at your beautiful blog Kim!! 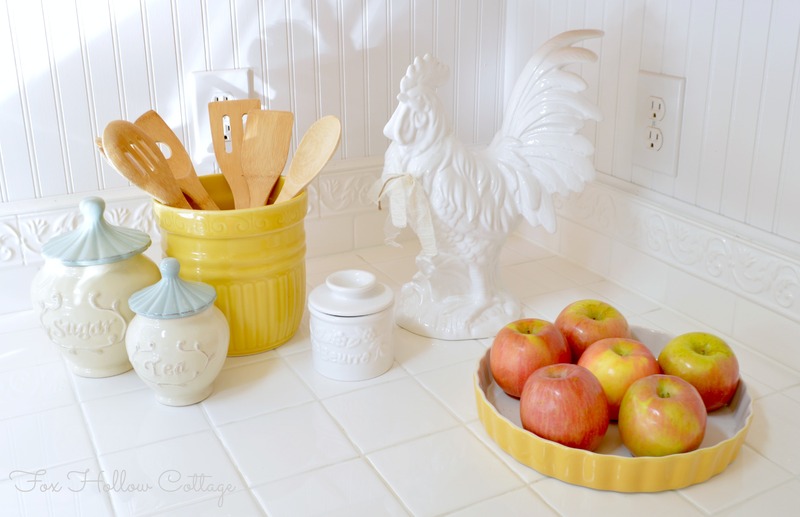 Love that sweet girl, and her charming kitchen! 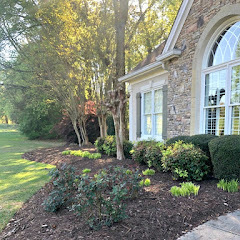 She's done an amazing job creating a beautiful home! WOW- the before and after made me gasp. Your guest blogger did an amazing job, didn't she? 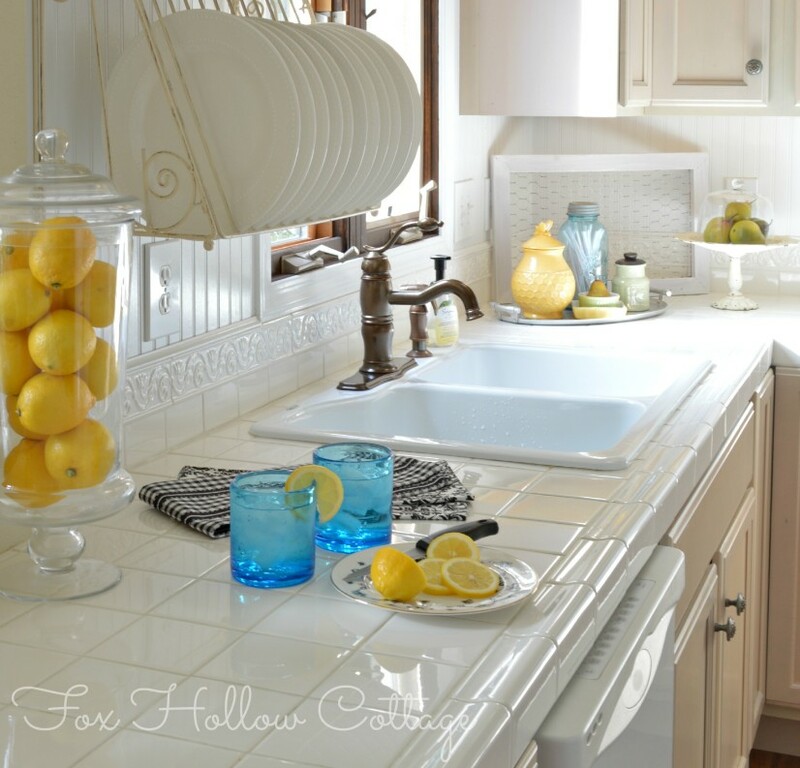 I love Shannon - then right after loving her, I love her aqua sunroom counter. Everyone really needs to pop over to her blog to get a better look at the counter. 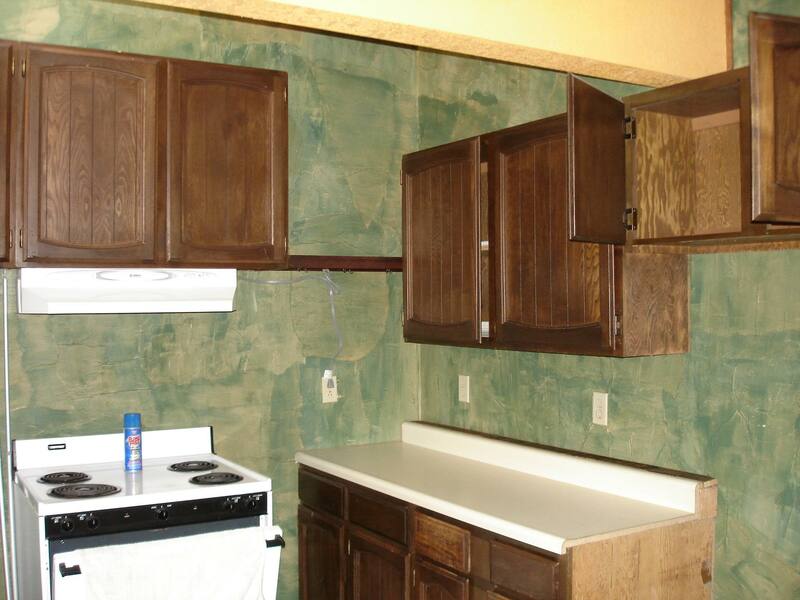 Beautiful job C: I am in the process of painting my kitchen cabinets... yuck! I love your wire plate rack! May I ask where you found it? 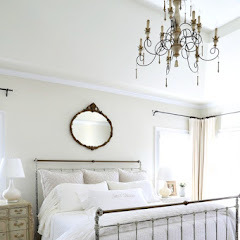 The ones I've been looking at are quite pricy and not as pretty... Adorable Blog! Shannon's home is beautiful, she has certainly done some amazing transformations! Such a beautiful remodel! Fantastic job. Such a bright and happy kitchen. Shannon has done a wonderful job!